The Mossad granted exclusive access to reporters from the Washington Post, Wall Street Journal and New York Times to view a selection of documents stolen from a top secret Iranian nuclear weapons facility. implosion devices of the kind used to detonate a nuclear bomb. The Mossad learned that after Iran signed the nuclear agreement (JCPOA) with the United States, Great Britain, France, Germany, Russia and China, the Iranians created a secret archive in a warehouse in Tehran far from the Ministry of Defense, whose records were known to the International Atomic Energy Agency (IAEA). Starting in February 2016, the Iranians began concealing documents, collected from around the country that explained how to build a weapon, how to fit it on a missile and how to detonate it. In an operation one official compared to the casino heist in the movie “Ocean’s Eleven,” Mossad director, Yossi Cohen sent a team of fewer than two dozen agents to Tehran to steal as many of these documents as possible. After two years of surveillance, the Israelis knew the habits of the workers and knew they had to be out by 5 a.m. to give them time to get out of the country before the guards arrived at 7a.m. and discovered the break-in. On January 31, 2018, the agents fixed the alarm so it appeared to be working as they entered the building at 10:30 p.m. After breaking through two doors, they reached a group of giant safes. The Times concluded the Israeli spies had help from Iranians to learn which of the 32 safes held the most important information and, using torches that burned at least 3,600 degrees, cut through those and removed their contents. Given the limited time, and likelihood the Iranians would claim the documents were forged, Cohen ordered the agents to take rather than copy the documents. When time was up, they split up and headed for the border, carrying 50,000 pages and 163 compact discs of memos, videos and plans. The Mossad did not reveal how they left the country – by land, sea, air or some combination – but an official did say “tens of thousands of Iranian security and police personnel” were searching for whoever burgled the warehouse. In April, Prime Minister Benjamin Netanyahu, briefed President Trump at the White House on the trove the Mossad had obtained and used it to reiterate his longstanding contention that Iran had been secretly working on a bomb, had not revealed the information as required by the JCPOA, and planned to use the hidden information to resume their pursuit of a nuclear bomb after the JCPOA expired. Proponents of the JCPOA countered that the agreement prevented the Iranians from turning the designs into reality and falsely claimed the documents did not contain any new information. On April 30, 2018, Netanyahu revealed the trove of documents to the public. A few days later, on May 8, Trump announced the United States would be exiting the nuclear deal. Indeed, the documents shown to the journalists indicated the Iranians had worked to systematically assemble the components needed to produce weapons, proving they had lied when they claimed to be only interested in nuclear energy for peaceful purposes. The Times noted the program, Project Amad, was also “larger, more sophisticated and better organized” than most believed in 2003, when the project ended. The documents detailed the challenges of integrating a nuclear weapon into a warhead for the Shahab-3, an Iranian missile. One document proposed sites for possible underground nuclear tests, and described plans to build an initial batch of five weapons. None were built, possibly because the Iranians feared being caught, or because a campaign by American and Israeli intelligence agencies to sabotage the effort, with cyberattacks and disclosures of key facilities, took its toll. The documents also included information about the Parchin military base near Tehran. This site was suspected of being the location of secret nuclear experiments. 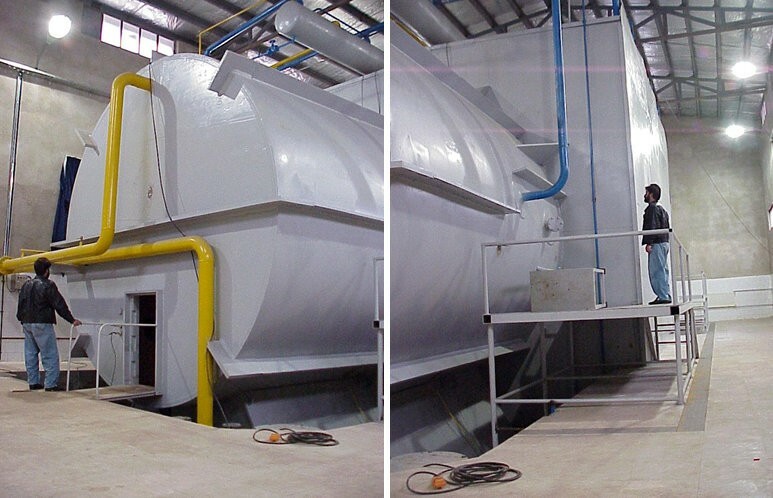 The Iranians emptied the building and sanitized the entire area by removing tons of soil to eliminate any traces of nuclear contamination before allowing the head of the IAEA to visit in 2015. The journalists were shown pictures taken inside Parchin, including some featuring a giant metal chamber built to conduct high-explosive experiments needed to develop nuclear weapons. Some documents also mentioned uranium deuteride, a form of uranium metal whose only purpose is for making nuclear arms, which could have been used to make neutron initiators. These devices can be used to detonate a bomb. Contrary to U.S. intelligence assessments, Israel believed Iran continued the program beyond 2003. Internal memos show scientists planned to secretly continue several projects within existing military research programs. For example, an Iranian nuclear physicist at the University of Tehran warned in one document that work on neutrons that create the chain reaction for a nuclear explosion must be hidden. “We cannot excuse such activities as defensive,” Masoud Ali Mohammadi said, “Neutron activities are sensitive, and we have no explanation for them.” Mohammadi was assassinated, most likely by the Mossad, in January 2010. Another document discusses the need to distinguish between “overt” nuclear research for peaceful purposes, and “covert” activities that had to be hidden because they could only be attributed to a nuclear-weapons program. Proponents of the deal say the stolen documents reinforce the need for it. “We were at the [negotiating] table precisely because we knew that Iran harbored ambitions to build a nuclear bomb, and we wanted a verifiable agreement to block those ambitions,” Jake Sullivan, a former State Department official told the Post. Joby Warrick, “Papers stolen in a daring Israeli raid on Tehran archive reveal the extent of Iran’s past weapons research,” Washington Post, (July 15, 2018).